Tigers are slipping away, and the world may lose this beautiful, iconic species unless threats to its existence are eliminated. century ago, there were 100,000 tigers. Today, according to the IUCN, there are probably fewer than 2,100 successfully breeding adult tigers in the wild. Several subspecies of tiger have already gone extinct, including the Javan Tiger and the Bali Tiger. Others teeter on the brink of extinction. According to Big Cat Rescue, there are only 1,200-1,500 Bengal Tigers, 500 Siberian Tigers, 136 Sumatran Tigers, and 20-30 South China Tigers left in the wild. Tigers are endangered as a result of hunting, prey depletion, and habitat destruction, but it is still possible to save them. Hunting is the most serious threat to the tiger’s continued existence. Tigers have traditionally been hunted for sport, and some countries that considered them a threat to livestock offered bounties for killing them as well. In India alone, more than 57,000 tigers were killed by bounty hunters from 1875 to 1925. Today, tigers are hunted primarily to support the trade in body parts for traditional Chinese medicine (though the large number of fake products on the market indicates that any medicinal benefits are probably placebo effects). 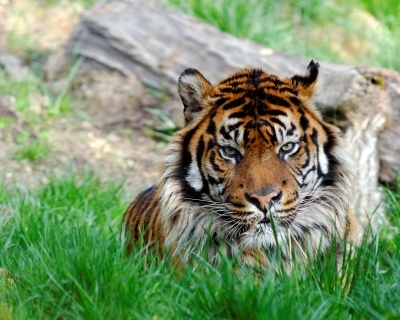 Tigers are also hunted to support a demand for ornamental skins, teeth, and claws. Fortunately, attitudes are changing. A recent survey found that the majority in China support the tiger trade ban and most legitimate traditional medicine practitioners have stopped using tiger bone. But stopping tiger hunting is not a top priority for overstretched, underfunded federal agencies, and penalties are rarely enforced. The ease with which poachers get away with illegally killing tigers has led them to go after other endangered big cats, such as Asian lions and snow leopards. Within a two-week span, poachers killed more than 5% of all Gir lions, a rare subspecies. An adult tiger eats about 50 deer-sized animals per year. Because of their enormous sustenance requirements, tigers need a large habitat. According to the IUCN, in the last 10 years alone, the tiger range has contracted 41% and become increasingly fragmented due to habitat loss and poaching. Habitat loss is a serious threat to the survival of tigers, as they have the misfortune to live in rapidly developing areas. Agriculture, commercial logging, mining, and human settlement are gobbling up the land. According to 21st Century Tiger, in Indonesia, deforestation occurred at a rate equivalent to 300 football fields per hour from 2000 to 2005. A particular problem is that forests are being eliminated to make room for oil palm plantations to meet the demands of the expanding biofuels industry. However, although some efforts to combat climate change are having a detrimental effect on tigers, others have been beneficial. For example, carbon credit trading has created financial incentives for local governments to protect their forests. With their habitats disappearing due to human encroachment and their prey decimated by poachers, tigers have been forced into closer proximity with people, which increases the likelihood of conflicts and accidents. Many tigers die when they are caught in hunting snares that have been set for other animals. Some are also hit by cars, and others are killed in retaliation for killing livestock or people. They can provide a sustainable source of income for local people, because tourists will pay large sums of money to see such charismatic species and their natural habitats. In the Galapagos, Australia, and Africa, a significant proportion of GDP growth is attributable to wildlife tourism. As large carnivores, tigers play an important role in a wide range of ecosystem processes. As an iconic, flagship species, tigers attract funding and conservation efforts, which benefit other species and the environment in general. Another reason to save tigers is that the tiger trade is run by criminal gangs that engage in other illegal activities. As such, allowing it to continue supports and encourages crime. Tigers can be saved. Like domestic cats, they have high rates of reproduction, and there is evidence that traditional conservation methods are effective when they are backed by sufficient financial and political support, and habitats and prey are protected along with the tigers themselves. Also, infrastructure can be developed in such a way that it preserves biodiversity. Funding for conservation varies from place to place and is often low in the countries where tigers live. According to Seidensticker (2008), the Indonesian federal budget for endangered species protection is just $1 per hectare, compared to $20 per hectare in the U.S., which underscores the need to raise conservation funding from other sources. To make a donation, volunteer, or learn about other ways to help tigers, visit 21st Century Tiger and Big Cat Rescue. For more on endangered big cats, see How to Help Endangered Wild Cats and Chinese Public Supports Tiger Trade Ban. 21st Century Tiger. “Tiger Trade,” “Habitat,” and “Tiger/Human Conflicts.” 21stCenturyTiger.org. Big Cat Rescue. (n.d.). “Wild Tiger.” BigCatRescue.org. International Tiger Coalition. (n.d.). “Facts of Tiger Trade and Farming.” 21stCenturyTiger.org. IUCN Red List. (2009). “Panthera Tigris.” IUCNRedList.org.